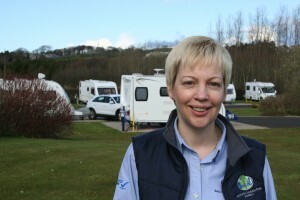 Ballyness Caravan Park in Bushmills, Northern Ireland, opened in 2000 for touring caravans, motorhomes and caravan holiday homes. A family-run business, the park’s owners David and Olive Dunlop work full-time on the site. Olive runs the reception and shop and looks after the touring park while David concentrates on the general maintenance and caravan holiday homes. How is 2016 shaping up for Ballyness Caravan Park? With the phenomenal success of Game of Thrones and other locally produced films, Northern Ireland is starting to get the national and international recognition it deserves for its wonderful scenery and produce, and this is helping to drive not only international visitors but domestic visitors who did not realise what we have to offer. If you had to identify one element, what is the most crucial aspect to the success of the park? Standards. Whether it is in services provided, cleanliness of the park or paperwork for customers, we aim for the highest possible. Who is the most important person in the business and why? Some people would say the next customer, but I would say the last customer. If he leaves Ballyness happy having had a great holiday, he will come back and also tell his friends. What challenges are currently facing the holiday park sector? The uncertainty of the political future with the EU Referendum is probably one of the biggest unknowns facing the holiday park sector. We are governed by a raft of EU regulations and no one knows for certain what would happen if we were to leave Europe, or for that matter what would happen if we stay in under the new deal. How have visitor expectations changed during your time in the holiday business? We decided a few years ago to be much more customer focused and if there is a problem getting it fixed as soon as possible and keep them informed at all times. This not only repairs the relationship but our customers are amazed by the service they get. Where do you see the park in 10 years’ time? We would still like the business to be successful 10 years down the line, but we keep an eye on the short to medium term and are quick to react to any changes or ideas that come up. “Do your own thing” advised a very good friend of mine. We were continually getting bogged down in petty rules and regulations and when we tried to keep everyone else happy, we found we were not progressing far. By doing our own thing, not only did we do it right, but better. Somewhere sunny and warm in December. We have four weeks off after working seven days a week for the rest of the year and at that time of year, we like to head to the sun.